The idea for this event was inspired by Mallory (The Haunted Reading Room) when she asked in the comments, "Can we do a sci-fi readathon sometime? I thought to myself, "Why not?" After all, I do host the Christmas Spirit Read-a-Thon in between my four other read-a-thons, AND I am sorely behind on my Sci-Fi reading. 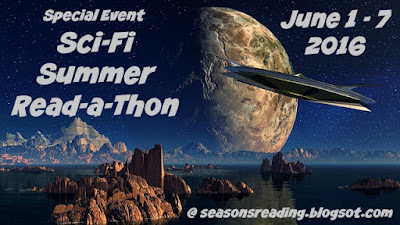 So, here we are...Sci-Fi Summer! Since this is a spur of the moment event, I'm not sure I will be able to secure any prize donations, but I will offer a small prize from me. I hope you're as excited as I am! If you have any questions at all, please feel free to contact me via the contact tab.